Poor Candy! The love of her life dumped her right before they were supposed to get married. His name was Bruce and he was an artist. 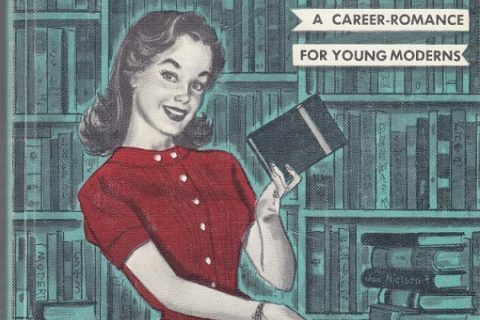 (Read: dirty hippy) Candy swears that she is never going to let any man anywhere near her very damaged heart and she throws herself into her nursing career. 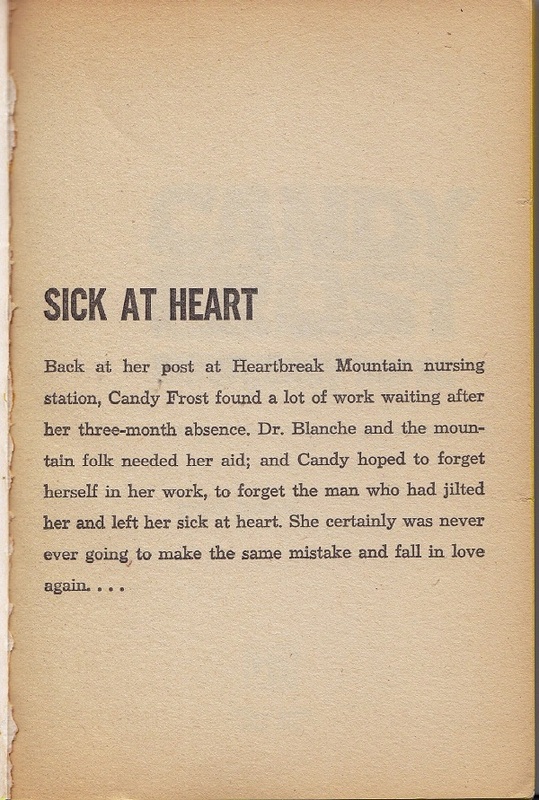 Candy gets her old nursing job back on, wait for it, Heartbreak Mountain. 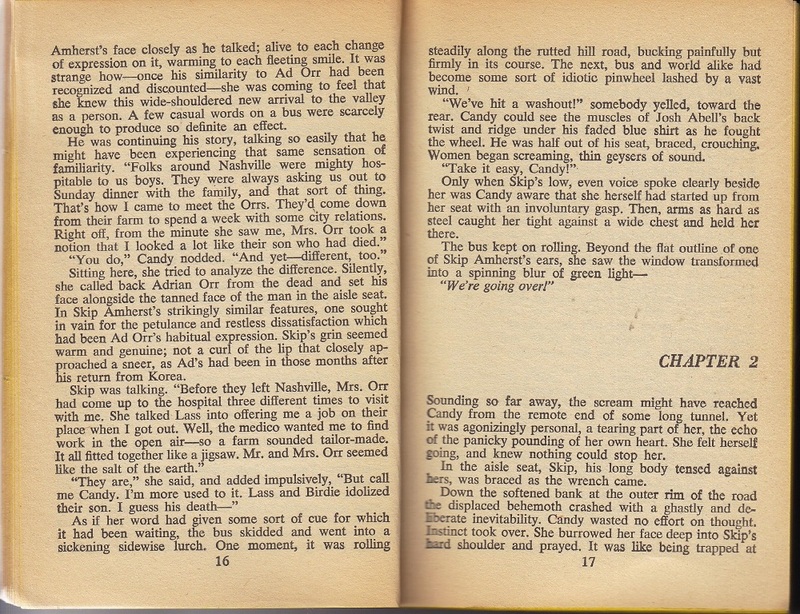 Of course she meets Skip, “the guy”, on page 2 after a harrowing bus accident. Will Candy “defrost” enough to let love back in her life? Stay tuned! 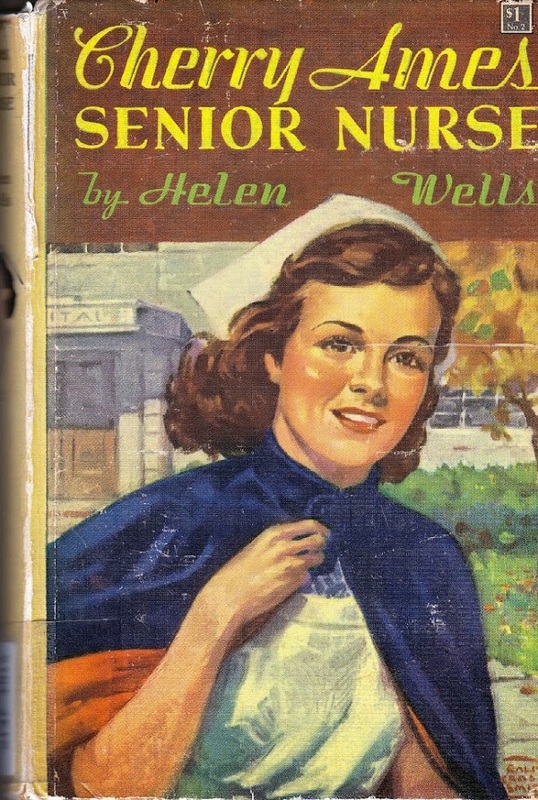 I like that the original title was “Nurse on Horseback.” I’d like to see her try to ride a horse in that tight uniform! LOL. Perhaps she would be perched sideways in front of someone with arms as hard as steel, etc. etc. But the best sentence I can see is the one about the displaced behemoth crashing with a ghastly and deliberate inevitability. 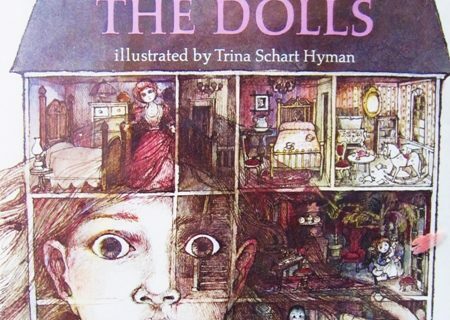 Was it a dark and stormy night, I wonder, to inspire such rhetorical richness? Thank you for that, Seabiscute. It really should have been the opening sentence, shouldn’t it? I’m still laughing. WHY would you name an adult romantic lead “Skip”? Probably the same reason you would think ‘Candy Frost” is a reasonable name. 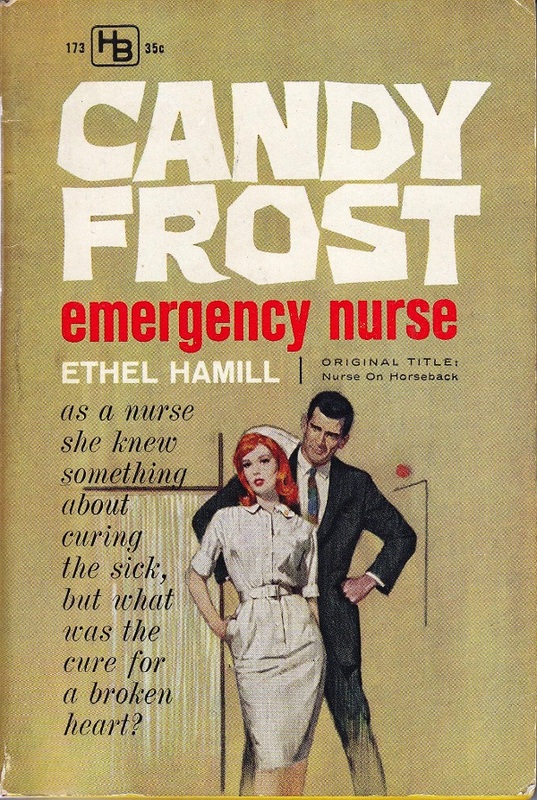 candy frost: as a nurse she knew something about snickers bars in the freezer, but what was the cure for a broken heart (besides eating said frozen snickers bars)? 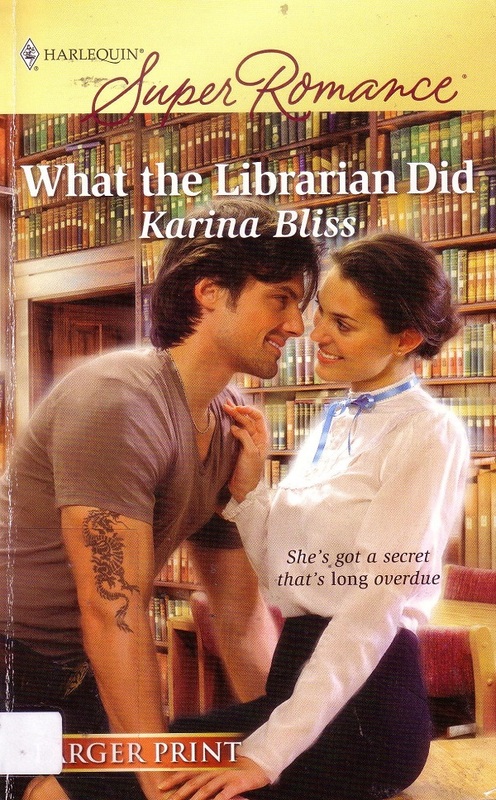 I think it’s hilarious that so many romance novels describe the hero’s chest as “wide.” in this case, our boy Skip is described as both “long” and “wide” (I’m assuming the wide chest the arms hard as steel were holding her against was his? Or is there a large storage unit on the bus as well?) and this make me think that Skip is actually just a large rectangle. Is this a sequel to the novel where she was romanced by Bruce? Do romances come in series like that? #3: Candy Frost, Serial Monogamist. #4: Candy Frost, Eternal Optimist. 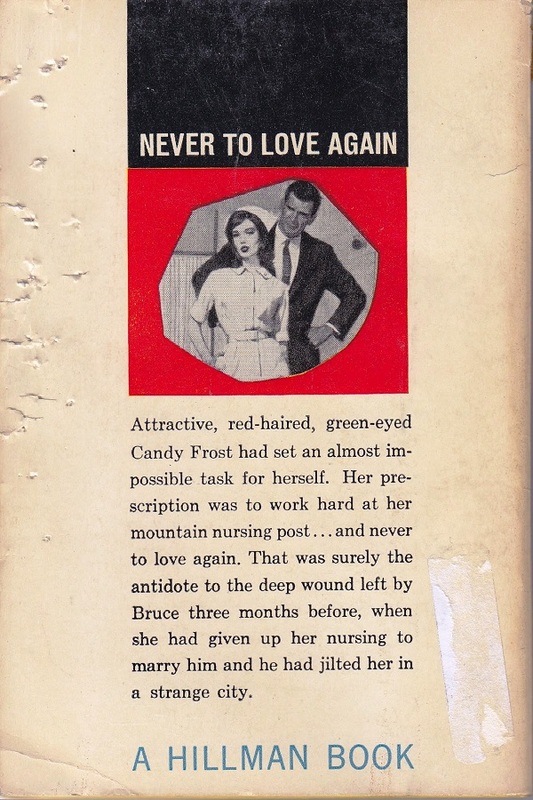 #5: Candy Frost, By Now She’s A Pathologist. I’m also wondering in what way the “strange city” was strange, but they probably didn’t mean like that. There is a place in China called “Thames Town” that is a nearly faithful reinterpretation of British traditional architectural styles, and almost unoccupied. That’s pretty strange. Then again, by reasonable standards, Las Vegas is a strange place. So is Washington, D.C., consisting as it does mainly of national monuments. Then, Boston, New Orleans, Los Angeles, San Francisco – each in their own way.